CLICK HERE to download and print the 2019 Koon's Pool Season Pass application. All members are encouraged to participate in a “members spruce-up day” on a Saturday sometime this coming spring. The date will be announced later. Come out and help make Koon’s Pool a nicer place to swim. Great Things are Happening at Koon's Pool And Will Continuine to Happen! The Koon's Pool board has embarked on a general improvement program to make our pool the best pool in the area. 1. Hand rails have been installed at the diving board. 2. Leak under the diving board HAS been repaired. No more water by the back of the diving board. 3. Robotic pool cleaner has been purchased to keep the pool cleaner, especially the bottom. 4. Lifeguards now all wear bathing suits identifying them as lifeguards. 5. Shade sails have been installed providing much needed shade to the pool area. They have turned out to be very popular with the guests. 6. Our Facebook page has been completely revamped and has been a big hit with anyone who visits. 1. All the major pipes in the pump area will be replaced. These pipes are original from when the pool was constructed and are in bad shape. If anything should break in this area the pool would be closed for a long time. 2. More repairs are being made to the baby pool to stop leaks. 3. Interior areas of the pools are being painted. 1. 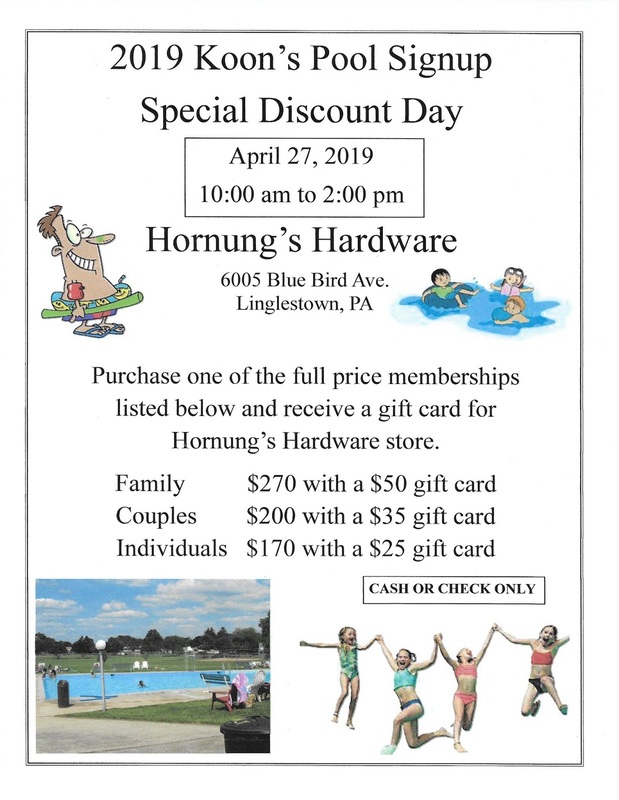 A spruce up day is planned for members to come out to the pool to help paint picnic tables, benches and other jobs that will make the pool look nicer. 2. The large crack on the bottom of the dive pool will be repaired. 3. The dive pool has been patched and will receive two coats of paint. 4. The pool has received a grant and we will be able to paint all the interior and exterior of the buildings. This is a major project we are hoping to have completed before the 2019 season. The daily walk in rate for non-season pass holders will be $10.00 a person. Children 3 and under are free. We will offer a Monday through Thursday reduced rate after 5 pm, the rate will be $5.00 a person. Please note anyone entering through the pool entrance will be required to pay the daily admission rate. Are you having a Reunion, or a Birthday Party this summer? Koon's Pool is available for private parties on Friday evenings. You will get full use of our picnic tables and full use of the pool! Book now! Please telephone: (717) 602-5265 for available dates and rates or check below. When you have selected a date that is still available for your party click HERE to download a copy of the contract for a private party at Koon's Pool. Fill out the contract and send or deliver it to the pool with a deposit of $50.00. The contract and deposit must be received at least two weeks before the party. Interested in joining the Piranha Swim Team? Please click on the link below for further information and all forms. We are now the Home of the Piranhas Swim Team!!! Located at the corner of Koon's Park Drive & LaPorte Street, Harrisburg, Pa. 17112 -- HOURS ARE 12:00 noon to 8:00 pm daily. We may close Wednesday's at 6:00 pm if there is a private party.